When people ask me how much a nine gem bangle costs, I generally give the following ballpark figures. However, it's important to realize that often we make bangles in stages when the client's budget cannot afford all the gems at once. 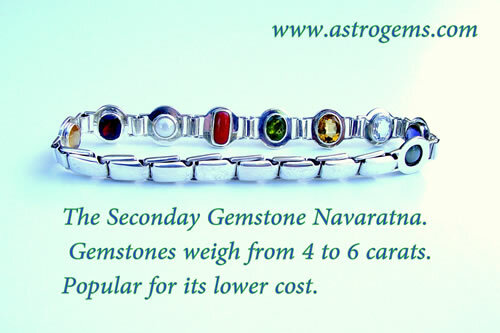 Often an individual can comfortably afford 4 or 5 gemstones but not the more expensive ones. 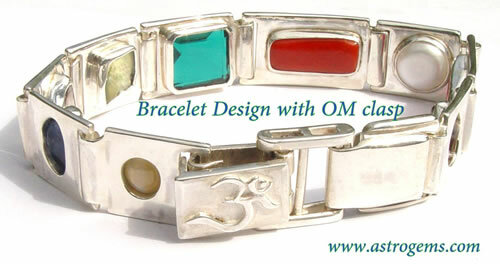 This is a great way of moving forward positively with an expectation of getting the full bangle in a year or two. 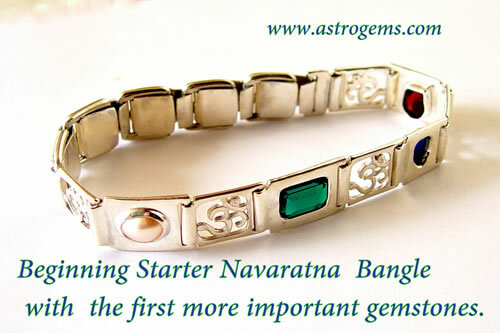 We call them Starter Bangles and they are great way to get the karmically improving project started. 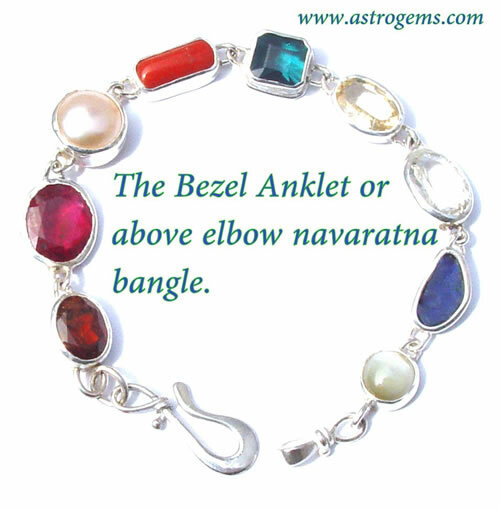 Often individuals never start getting a bangle because they think they have to get all of them at once and its just too big an expenditure. 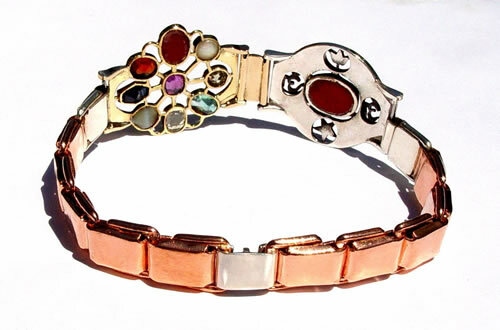 Some of the examples below refer to bangles that were sold years ago. With the U.S. dollar's devaluation and the availability of astrological quality gems, prices frequently change. Please contact us for an accurate current quote. 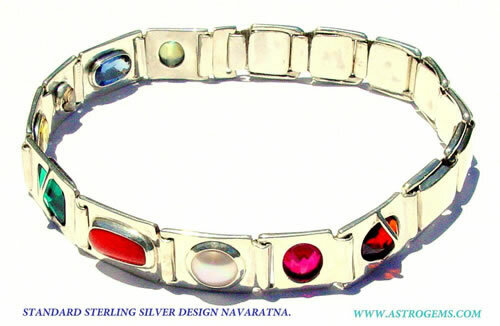 In addition to our US Office, our Navaratnas are also available for purchase from our office in Jaipur, India. For more details, please contact us. With all stones we sell, if a client wants to upgrade a gem in the future, I offer a full money back guarantee as long as the stone is being traded back in for its primary equivalent or of the same variety but of higher quality. This generally has to be done in person by the client visiting the shop as the low markup does not allow for the time involved with posting and packing etc. 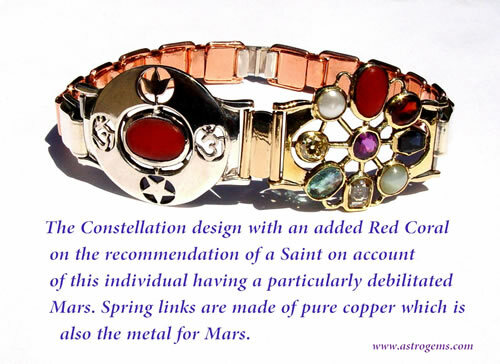 Because of this clients like the following bangle purchaser can relax that the hard earnt money they are putting towards a bangle does not get wasted if they decide later they want a more appropriate stone or one of higher quality. 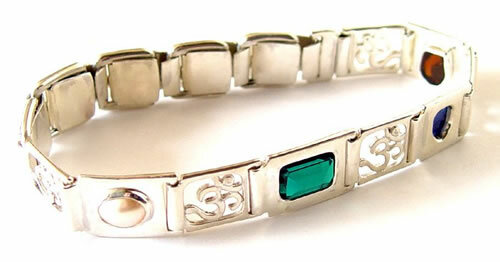 Sometimes a client may take a few years before they are really happy that they have reached their goal gem wise. 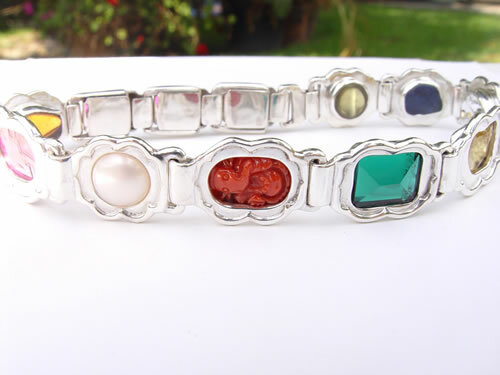 The only two stones I do not always buy back at full price are the pearl and the red coral. This is because over time they both can shrink due to wear and tear and this devalues them. No Diamond. The person opted to go with White Beryl instead. Laboratory-grown faceted Emerald. Like the ruby, it is all of superior quality. Tumble polished, medium quality stone with good fire but has a pit on the surface edge. This person opted to go with a White Beryl instead. 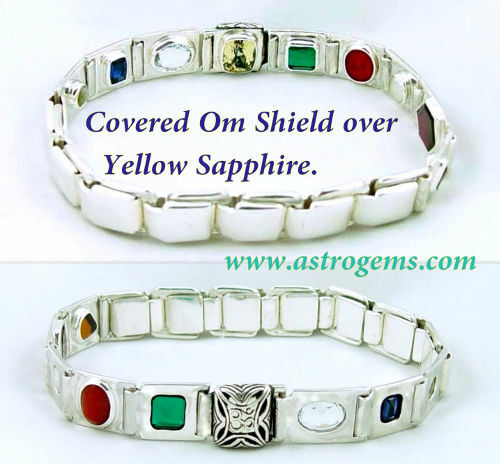 While it's a great astrological gem, it's not as potent as the much harder Diamond. At $36 per carat, we could choose a nice, large White Beryl to compensate for that.This person later upgraded to a Diamond. In the case of any upgrade, we will buy back all substitute stones at full price. Yellow Beryl is a powerful stone with great color that many people prefer to the Yellow Sapphire. It is also very economical. This was an uncut stone, but we also have faceted Yellow Beryl. This was a very good quality, natural, unheated, deep Blue Sapphire. This is an incredibly low price for a Chrysoberyl Catseye. 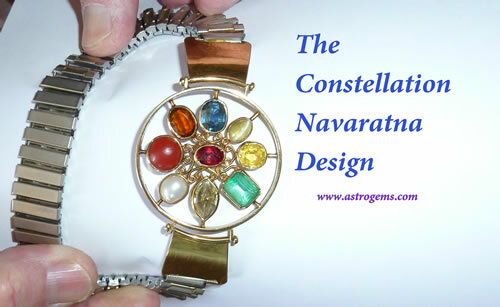 It's an adequate astrological stone, but a good candidate for an upgrade one day if the client so chooses. This was a good-sized Coral. Because the piece was of a more pale color, we were able to bring down the price. We use superior quality laboratory-grown Ruby crystal grown by methods that result in a genuine Ruby, not a chemical melt mix synthetic. All White Beryl is of superior quality, but it is not nearly as powerful a stone as the Diamond. Beryls are quite hard (Emerald is a beryl) but the Diamond is still many times harder. A great part of the lifeforce in a gem comes from its hardness and size. White Beryl is considered to be a Venus stone, but our experience has shown that this is by no means a comparable gem to the Diamond. As stated earlier, the person later upgraded to a Diamond. This person was budget conscious, so we put together a bangle that contained a lot of uncut stones for maximum benefit at minimal price. Our high end uncut diamond normally costs about $750 per carat. A diamond with a few minor inclusions can help bring the cost down. Normally when dealing with uncut stones, we like to go with bigger stones, to compensate for small imperfections that tend to be found in uncut material. A 2.24 carat uncut stone is small, but this person had a very strong Jupiter and this stone was particularly clean. The outstanding feature of this stone is the deep blue color which unlike 99% of most faceted deep blue stones is definitely unheated as a friend of mine in Australia that owns the sapphire mine supplies me directly. 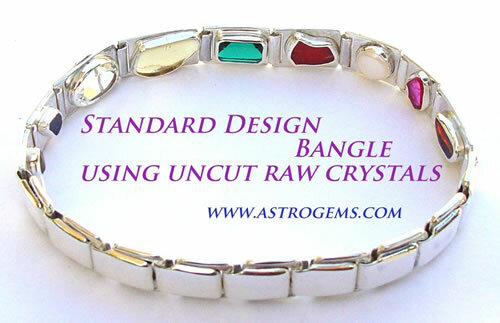 These crystals are bought for there flattish shape that allows for a comfortable and large skin contact which allows for maximum electro-magnetic radiation's transfer. A top of the line Chrysoberyl Catseye can quickly get up to eight or nine hundred dollars per carat. 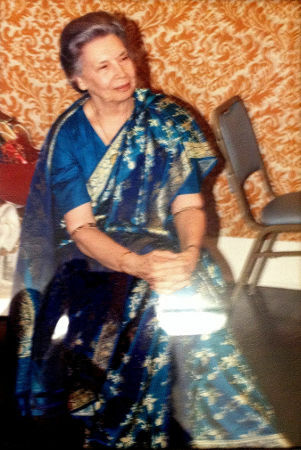 And even then I have some extraordinary specimens in the milk and honey variety that leap past the $1000 a carat range. 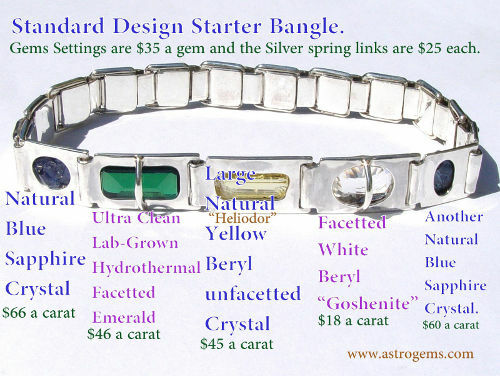 Though this price is dictated by fashion and rarity and not the quality of the gems homogenous catseye phenomenon. Once again, because this person was budget conscious and had a strong Ketu, we chose a low carat, mid-range stone. Mars is this person's strongest planet, so he did not need much coral. He got a small piece with a deep red color. Often we have clients who have a well placed coral but still express weaker Mars indications like sensitivity to the cold or lack of physical energy. 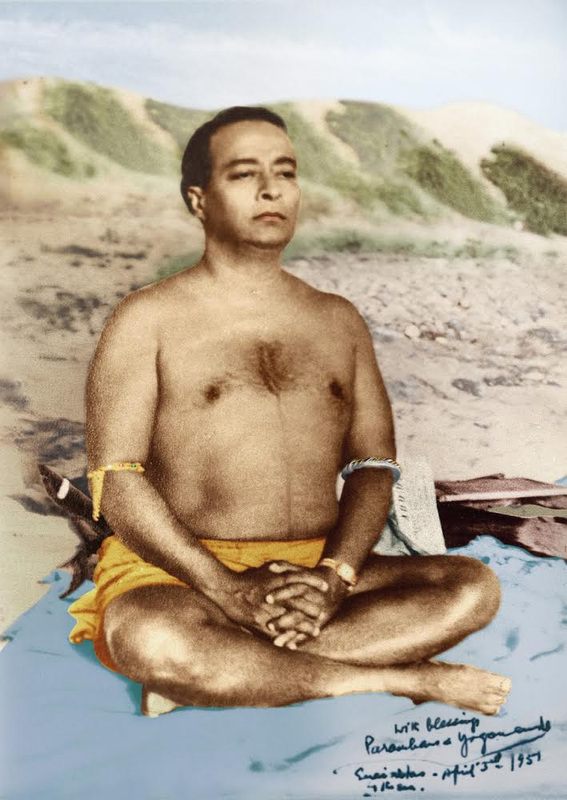 I like to stress that as we get older our receptivity to planetary energies gets severely weakened and this is part of the condition for many . However for remedial strategy to combat this a coral necklace is wonderful tool to experiment with to evaluate its often dramatic usefulness. 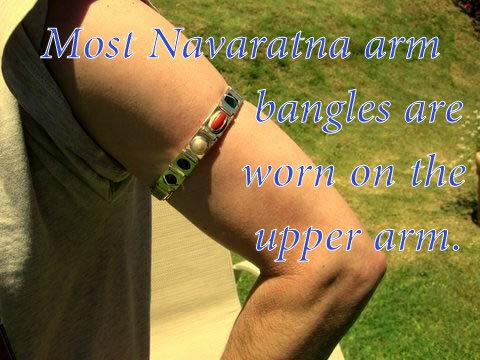 It can be worn for a few days when one feels low on energy or is combating a cold winter and removed when summer is flying its warm colors and are fitness is coming around. Normally pearl is only around $100 total, but this person happened to fall in love with a high end piece and wanted it despite his budget. Sometimes people are drawn to certain stones. All of our laboratory-grown ruby crystal is genuine and very clean without enhancement. The emerald is laboratory-grown as well, also flawless. 10.5 carats is on the large size for an emerald. Most people get around 7 or 8 carats. Good quality diamond. A few minor inclusions brought the price down by $60 per carat. A typical price for our uncut Yellow Sapphire crystals. The eye was not sharp, nor obviously visible indoors. This accounted for the low cost of the stone. A good piece with a deep, red color. Once again, a good quality piece. Tumble polished, high quality stone. Our best quality Diamond is normally $750 per carat, this person found a piece she was particularly drawn to for $690. 4.44 cts is a good size for a Diamond and can sometimes be as much as half the cost of the bangle. The Diamond is by far the most powerful stone. Faceted Yellow Beryl starts at around $85 per carat, but this stone had particularly good canary yellow color. Also, as the carats increase, so does the price per carat. A high quality faceted 6 carat Yellow Beryl, for example, might cost around $150 per carat.Yellow Beryls often have color stronger than most unheated Yellow Sapphires. This person wanted a large Diamond which accounted for much of the budget, so she chose to go with a mid-range quality Catseye. Mars was this person's strongest planet, so she did not need to spend much on the Coral. Although heavy in weight, it was lower-priced than a barrel shaped Coral or a high end cabochon. Most of our good quality Pearls are between $80 and $100. 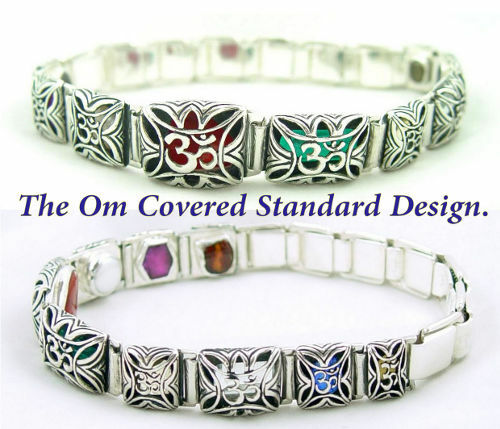 We have exceptional quality for more, but astrologically it is not necessary to spend more. For astrological purposes, this person could have done better going with uncut tumble-polished Hessontie. But because she wanted all faceted stones, she got a superior quality hessonite for $90 per carat. 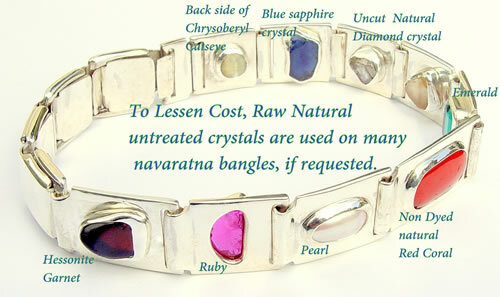 Every stone on this bangle was the highest possible quality. 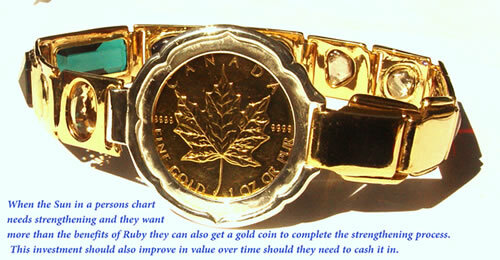 When a customer gets a gold bangle, we make no profit on the cost of the gold. We charge only what it costs us to have the material cast. This person had a bit more of a budget, so she was able to go with better quality, faceted stones. 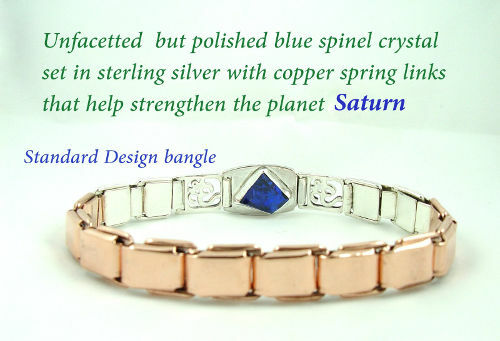 She also had the luxury of getting the bangle done in gold, which added and additional $10,800 to the cost of the bangle and weighed over four and half ounces. 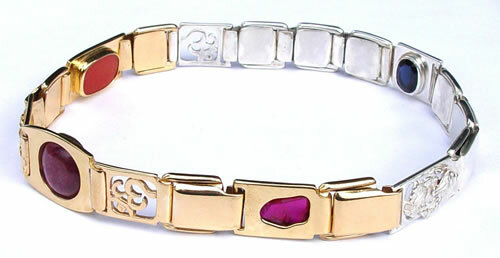 We strongly advise having the piece made in 22 karat gold as the purity of metal provides an added benefit to the wearer. From a metallurgical point the gold is very soft but this can be overcome by a special process treatment at the casting stage. When a client selects silver I can buy back the setting and the stone at full price if the client wants to upgrade or utilize the ten day return policy. I do not however offer this service if the client wants to go in gold. 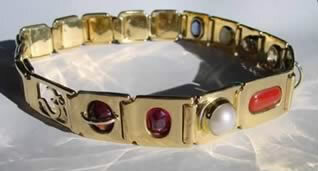 To overcome this risk I often advise that the individual get all the stones set in silver first and then when they are completely happy with the gem selection and the effects for them, they can have the bangle remade in gold and I will buy back the spring links at full price and they will only pay the average $50 Per gem setting charge. She got our highest quality uncut diamond. 4.07 carats is on the large side for faceted yellow sapphire. $640 per carat got her a rather pale stone. She also got a large mid-range Blue Sapphire. 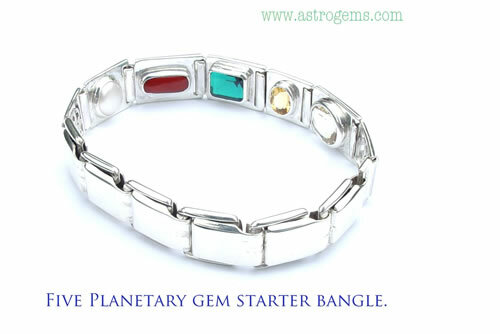 For more information on starter bangles click here. 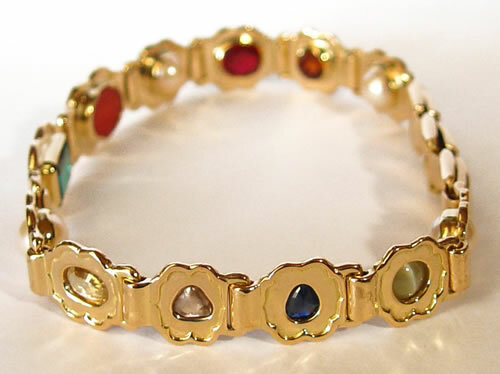 To purchase a bangle in a more affordable gem-by-gem approach, find more information by clicking here.